Turkey’s long-standing leader Recep Tayyip Erdogan has won the country’s presidential poll in the first round, the election authority chief says. Sadi Guven said the president “received the absolute majority of all valid votes”, but gave no further details. State media reports put Mr Erdogan on 53% with 99% of votes counted, and his closest rival Muharrem Ince on 31%. The polls were the most fiercely-fought in many years, and Mr Erdogan is set to assume sweeping powers under a new executive presidency. There are reports that Republican People’s Party (CHP) presidential candidate Mr Ince has admitted defeat in a message to a journalist, though this has not been confirmed. Earlier on Sunday he accused state-run news agency Anadolu of “manipulation” over its reporting of vote-share figures. Mr Ince tweeted that he would make a statement at 12:00 (09:00 GMT) on Monday. There were another four candidates on the presidential ballot, none of whom appears to have won more than 8.4% of the vote. President Erdogan will assume major new powers under Turkey’s new constitution. The changes were endorsed in a tight referendum last year by 51% of voters, and are due to come into force after the election. The job of prime minister will also be scrapped. Mr Erdogan maintains his increased authority will empower him to address Turkey’s economic woes and defeat Kurdish rebels in the country’s south-east. In his victory speech, he said Turkey would act more firmly against terrorist groups, and would continue to “liberate Syrian lands” so refugees can return to their homes there. Mr Erdogan was prime minister for 11 years before becoming president in 2014. Under the new constitution, he could stand for a third term when his second finishes in 2023, meaning he could potentially hold power until 2028.
Who won seats in Turkey’s parliament? Mr Erdogan said the governing alliance led by his AK Party (AKP) had secured a majority in the 600-member chamber. “Turkey has given a lesson in democracy to the entire world,” he said. State news agency Anadolu said the AKP itself had 42% of the votes for parliament with 99% counted, while its partner, the MHP, had 11%. It put the main opposition CHP on 23%. In a development that will please Kurdish voters, the pro-Kurdish HDP has exceeded the 10% threshold needed to enter parliament. With 67 seats, it will form the chamber’s second-largest opposition faction. 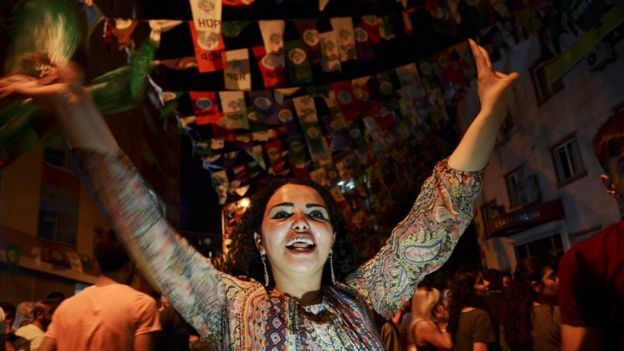 Fireworks lit up the sky in the Kurdish-majority city of Diyarbakir as results came in. The party’s success comes despite the fact its presidential candidate Selahattin Demirtas is in a high-security prison on terror charges, which he firmly denies. Was the voting free and fair? Security was tight at polling stations. Ahead of the vote, concerns had been raised about potential voter intimidation and electoral fraud. Turkey’s election commission has already said it will investigate alleged irregularities in Urfa province, on the southern border with Syria. Voter turnout was high at almost 87%, the state broadcaster reported. Mr Ince had said he would spend the night at the electoral commission’s headquarters in Ankara to ensure a fair count. In a tweet, he asked election observers not to leave the ballot boxes. Rights activists have said the press is not free to report on all sides in Turkey. It has become the world’s biggest jailer of journalists under Mr Erdogan’s rule, according to monitoring groups. What were the election issues? The biggest was the economy. The Turkish lira has tanked and inflation stands at around 11%. Terrorism was another key issue, as Turkey faces attacks from Kurdish militants and the jihadists of the Islamic State group. Mr Erdogan’s rivals accused him of damaging civil liberties in Turkey and spearheading a slide into authoritarian rule. Turkey has been under a state of emergency since a failed coup in July 2016, with 107,000 public servants and soldiers dismissed from their jobs. More than 50,000 people have been imprisoned pending trial since the uprising. 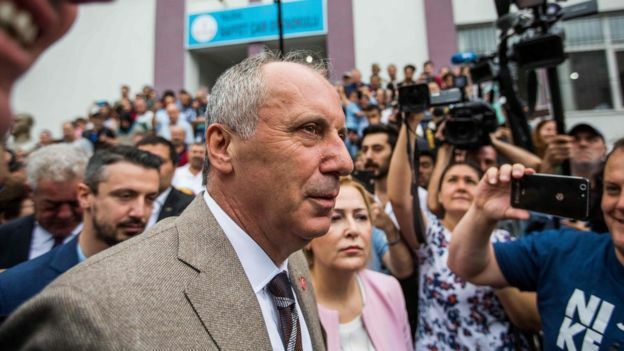 CHP candidate Mr Ince’s fiery campaigning helped to revitalise Turkey’s downtrodden opposition – but ultimately he lacked the numbers to end Mr Erdogan’s dominance.